John Keeley has revealed why he turned down Wigan’s advances. The Pompey goalkeeping coach is staying put at Fratton Park, despite the Latics making an approach for him. 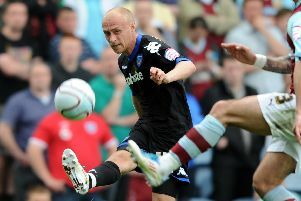 Paul Cook wanted to take Keeley to the DW Stadium after his exit at the end of May. His assistant Leam Richardson followed him north with physio Andy Proctor and fitness coach Nick Meace also on their way. Keeley, who is in his second stay with the Blues, didn’t want to follow suit, with Robbie Blake also staying. The 55-year-old spoke of his affinity for the club and felt remaining was the right thing to do. Keeley said: ‘There was no way I wanted to leave Pompey. I’ve loved my time here and enjoyed my six years here before. ‘It was only unfortunate circumstances which meant I had to leave then. If we were in the same position as we are now I would never have left. ‘I’ve loved my time here. It’s a brilliant football club and I just love being around the place. I love matchdays, the new training ground is nice and the people are great. Keeley has been impressed with the impact of Kenny Jackett as Pompey returned to training. He is upbeat about the club’s prospects under their new boss. Keeley said: ‘I quietly hope and believe we can have another good season.